As we watch the sun lighting across trees and bushes on this bright afternoon, hearing birds singing and looking toward spring, it seems easy to persevere. And yet, there are times, as the artist and poet often notes, that even when externally all is well, internally we doubt, stumble, and fall. In thinking of this, we offer a few poems that might feed your spirit in times of hardship, when you need a little encouragement or a reminder of your own well of greatness. Among the definition of Intention is one from medicine: “The healing process of a wound.” The more common usage of the word is: an aim or plan. In the prior usage, the word deals with whether or not a wound has enough material to heal from connections of tissue and skin. Is everything touching, are there any gaps? In the latter definition we are speaking of our commitment to an outcome. What do I want to happen? It often arises when there is a gap between what we want and what we are living. It is our resolve to see that gap healed. But sometimes we have to admit, the gaps are wide and difficult to bridge. Intention can seem a thin tool with which to do the hard work of building connections. Our January theme of Intention is well timed. We can all benefit from asking ourselves about how we are living and what we really intend. Life is too often so fast paced and demanding that we can easily forget what we really intend in life. In fact, we can go years without giving it much thought at all. And all the while, we feel the emotions that always measure what it costs not to be yourself and not to live as we really want to live. This January and throughout our winter, with the help of Rev. Sue Sinnamon and our adult formation programs, we want to go deeper. Winter is a great time to do this important work. The cold and darkness remind us to turn inward and take stock of ourselves. Even if you live a busy life caring for children or others, we hope to help you connect with the opportunity to go deeper into the question of what you intend. We hope we can all connect with our aims, strengthen our understanding, clarify intention and connect with the steps that lead us closer to the personal alignment of life and values. It always feels best. So we are putting out the call to examine what we intend through the month of January. What do you intend with your life and your living? What is the plan you live and ends your serve? How do you assess the connections around old wounds or recent injury? What is your plan for wholeness? I look forward to our conversations on these foundational questions and to your answers to this question: What is your intention? 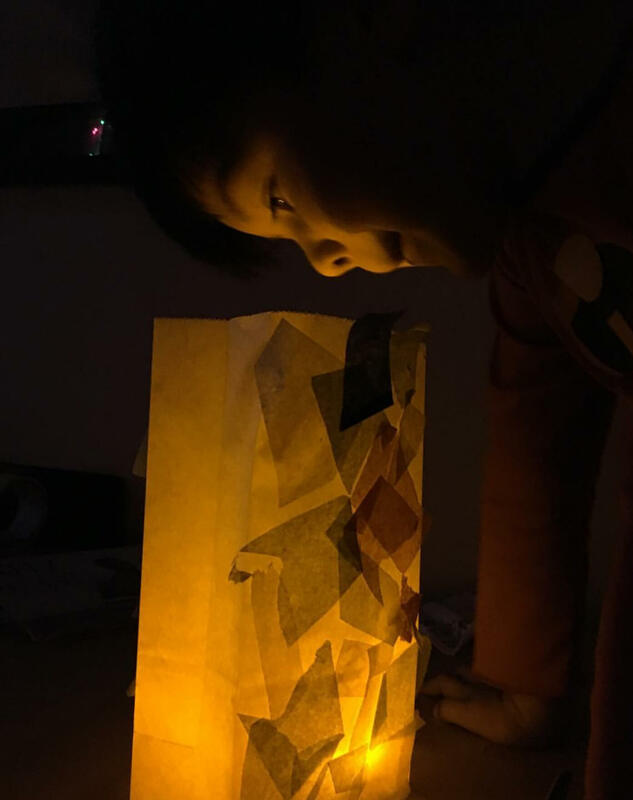 Help us make luminaria of hope for the Christmas Eve Service! Visit the table by the Great Hall to decorate a paper bag with colorful tissue paper and messages of hope and inspiration. We will use them to line the chancel and entrance to the church on Christmas Eve. Hope. Is the Possible, Positive? In the twelfth month of the calendar months, we come to HOPE. It slips in, in time for possible neglect amidst preparation for holidays and travel. Our calendars fairly begging us not to add one more thing. Our minds juggling how to get the work done and still take time off. Our disposition a bit rushed for thinking about a word that seems to do what we would rather not . . . to look outside ourselves and believe that the possible is positive. Few of us are encouraged to take time thinking about what we hope for. We are assumed to hope for personal happiness and the happiness of family and friends but how much time do we take to reflect on “what does make me happy” and do I know how to be hopeful about that? Hoping, for many of us, is little more than a thin wish for unspecific good. We may not even imagine we should waste time on any sort of hoping. Yet we know that the greatest psychological predictor of perseverance, the helpmate of happiness, even the support for compassionate living are rooted in our capacity to hold hope, even when it may be elusive. That makes hope the midwife of living well. Hope is no lightweight. It deserves our attention. I invite you to give yourself a valuable gift this December. Take time to consider hope in your life. Think more deeply about it than you may yet have done. Look at how it is or is not working in your life. Take it apart, so that you may put it back together in a way that makes sense and life more valuable and true for you. Talk about it seriously and ask whether what you hope for has real roots and real branches upon which to grow your life well. Your investment in hope, a real, adult and grounded hope, will nourish you and renew your self-understanding. It will make clear what is foggy. It can increase the peace. For all of us, that is what I am hoping. the sacred circle of life, and instruct us to live in harmony with the rhythms of nature. moving me like a weed in a river. and justice be connected? Will we take time to express gratitude? high school may not have been the best spokesperson to connect deeply with seven year olds. Oh yeah, I thought. I don’t know what I am supposed to tell my Mother. Nothing is clear but now, at last, I will be told what it is I am about to say…but nothing after that was any more sensible than what went before. For some reason, I could sit silent no more. Shooting my hand in the air so purposely, it was not ignorable, he relented before going on. Father, what is an “A-bun- dant-ly”. What does it mean? love for you, like your parents love for you. Father Mullen just wants you all to show them all how much you love them too when Saturday comes. It can be difficult to talk with children about courage, what it means for them, how to engage with it, etc., most especially if parents/adults have not “checked themselves” about how they are engaging children. Courage is not about not being afraid. It is about being afraid and doing what you need to do anyway. The way we see courage depicted in literature, art, and drama is all over the map. We see the coward who suddenly seems converted to bravery, the strong, admired hero who cowers when confronted with the truth and the anti-hero who winds up sticking around to take a with strangers. It makes sense that we don’t agree on courage, the need for it and whether we ought still to imagine we can encourage it in our culture. This plays out in interesting ways. Parents often teach their children to be more risk adverse than brave out of a fear that they might be injured. Those with significant fears seek therapies or martial arts trainings. Some practice heroism rescuing Zelda. Others face the challenges of Marine boot camp. We all have some strategy for figuring out courage…including denial that it matters to us at all. What I think is important for each of us to learn, know and remember about courage is this: it happens with fear. Being afraid is usually found right along with courage. People who are brave without fear are just reckless. Courageous always know a lot about fear and yet they also know about doing what is required anyway. They are in touch with the heart within. They know the possible cost. They understand the risk. But they will not excuse themselves from what is required just because they fear what might follow. What must be done, must be done anyway. I admire courage more than just about any virtue when it serves others, risks for others. When I first saw the photos of Birmingham youth braving the water cannons and dogs of that city, I was amazed at their bravery. When I read the story of Wesley Autrey, who leapt to the aid of a stricken subway rider by flinging his body over the man on the tracks, I was in awe. When I think of the firefighters walking up the World Trade tower, I am humbled. But I am also taken with the politician who takes responsibility, the bystanders who get involved, the teacher who challenges the system or the employee who complains about how someone else is being treated. Which is to say…I am often privileged to be proud of you. We spent a good deal of time last year discussing covenant. Now we consider what our present covenant contains and whether it can or should be renewed. What do we promise to one another and how can we deliver? We sense that the times when courage is required are not the best of times. Does the evidence really support this idea? Does the spirit within? In many voices, a reflection on what the community of First UU has done, experienced together, lost and regained.